Stomp into winter this year with a boot that means business! 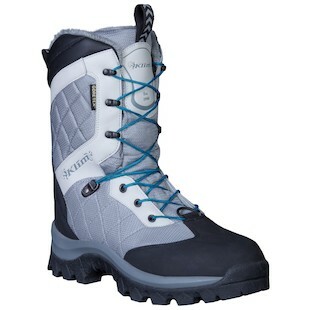 A heavy duty player in serious women's snow wear, Klim is one of the only brands offering armored, insulated boots for women. The Klim Aurora Boots for women is made with a full Gore-Tex liner to keep you dry in any conditions, whether powder, ice, or slush. A high boot that offers excellent support for an active snomobile rider, the Aurora GTX will keep you warm in the coldest conditions. How? With 800 grams of 3M Thinsulate, offering maximum warmth and minimum moisture retention as it wicks sweat and passes it through the highly breathable Gore-Tex liner. Don't wear this in spring, don't wear it in fall. Wear the Aurora boots in the dead of winter when your boyfriend asks if you'll be too cold on the mountain to play in the snow.